In most cases, the beginning of the kayaking and snorkeling guided tour takes place at 10:30am. The kayaking and snorkeling tour is available from Monday to Friday throughout the year. We are comparing Tenerife Kayaking Tour and Snorkeling with Turtles and Rays Prices from leading ticket suppliers and Try to find you Cheap tickets prices on the market. 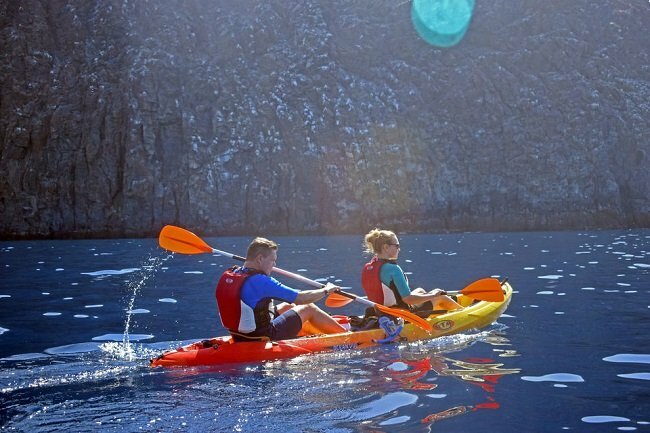 This entertaining tour combines kayaking along the beautiful coastline of Tenerife and snorkeling at one of the best locations for an underwater experience around the Island. The activity begins with kayaking along beautiful cliffs of Tenerife Island to the snorkeling spot accessible only through the sea. The destination for snorkeling was picked up because of its abundance of the marine life. Besides sea turtles and bull rays, starfish and octopuses inhabit these waters among many other species. The tour is limited to 10 people so the number of participants doesn't impact the experience in a negative way. If you like experiencing something new and get entertained along the way, you should book this activity. Above all others, the Kayaking and Snorkeling activity is ideal for naturalists and fans of the underwater world. Your Experience With Tenerife Kayaking Tour and Snorkeling with Turtles and Rays? Start this outstanding recreational activity by kayaking your way to the spot ideal for snorkeling with turtles, rays and many other sea life species. Once you start snorkeling, a spectacular underwater environment with turtles, octopuses and many fish species will literally amaze you. You will be able to swim alongside turtles and examine them closely. While observing the seabed, you won't fail to spot bull rays that glide graciously. What Tenerife Kayaking Tour and Snorkeling with Turtles and Rays Includes? All necessary equipment for kayaking and snorkeling is provided for this activity. Among those, you will receive wetsuits suitable for the season, masks, life wests, aqua shoes and fins. The expert guide will accompany you along the way. In addition, photo opportunities are a part of this entertaining tour. It is possible on this snorkeling experience to see octopuses, and starfish among many other fish species. You may wish to consider taking flippers for an opportunity to swim faster and see more on this snorkeling tour. Make sure that you are in a good physical shape in order to enjoy this exciting activity. Travelers Reviews about Tenerife Kayaking Tour and Snorkeling with Turtles and Rays? Travelers that commented this activity on the Get Your Guide website have given the tour the average 4.8 out of 5 rate. Reviewers stated that they received a good briefing, a quality equipment and a great assistance from the guides. They enjoyed both kayaking and snorkeling, as well as observing the marine life from up close. The experience isn't suitable for people with disabilities and non-swimmers. You may enclose either paper or electronic voucher to take part in the kayaking and snorkeling tour. You may cancel up to 24 hours before the beginning of the tour and receive the full refund. While snorkeling, refrain from making physical contact with turtles in order to avoid stressing the beings. It would be useful if you have previous snorkeling experience, but it isn't mandatory for joining the tour. Calle El Coronel 1, Los Cristianos is the departing point of the Kayaking Tour and Snorkeling with Turtles and Rays.